Featured Indie Book on Indie Author News: Young Adult / Action and Adventure An Extra-Ordinary Beginning by A. D. Winch. The Book has been self-published via Smashwords and Amazon and is available as eBook and Paperback - 300 pages. A. D. Winch, or Antony, is the author of The Adventures of Eric and Ursula and originally from the UK. Eighteen years ago, he left England and since then he has lived in Transylvania (close to Dracula's castle), war-torn Sri Lanka and above the Hadron Collider in Geneva. Currently, he lives in Prague, not too far from a tower that looks like a space rocket and is covered in giant babies. 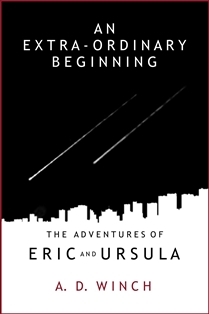 The idea for The Adventures of Eric and Ursula came to Antony while hiking in the Tatra Mountains in Slovakia; they are his first series of novels. Book 1 is out now, Book 2 will be released this month and the final two will come out within the next year. Over the last fourteen years, he has written, and directed, plays for children that have been performed in the UK, Romania, Sri Lanka, Switzerland and Czech Republic. For an older audience, he wrote the films Seagulls and your baby disappeared. Seagulls was shown at the Brighton Film Festival and your baby disappeared premiered in Prague in 2011. When he is not writing he enjoys spending time with his family, cycling, watching movies, listening to comedy and being creative.